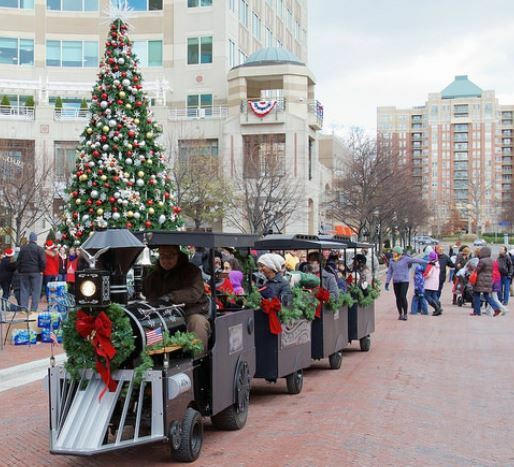 Celebrities, floats and marching bands are scheduled to parade through Reston Town Center the day after Thanksgiving to kick off this year’s annual Hometown Holidays event series. This year’s parade takes place in the town center on Nov. 25 at 11 a.m. 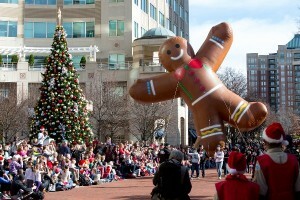 The holiday event regularly attracts about 10,000 spectators from across the area. NBC4 News anchors Angie Goff and Chuck Bell are slated to emcee this year’s parade. Members of the youth organization Amy’s Amigos Serving will serve as the event’s grand marshals, organizers said. Parade attendees are encouraged to come out early, as thousands of special, commemorative jingle bells will be handed out for children to ring during the fun. Before the parade, bells can be picked up along Market Street and in Fountain Square, or you can find them by Mercury Fountain and in the Pavilion after the event kicks off. Additionally, thousands of volunteers are needed to make the parade a success. People are needed for jobs like balloon wrangler, line marshal and character assistant. 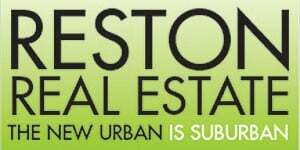 Get more information and register to volunteer on Reston Town Center’s website. 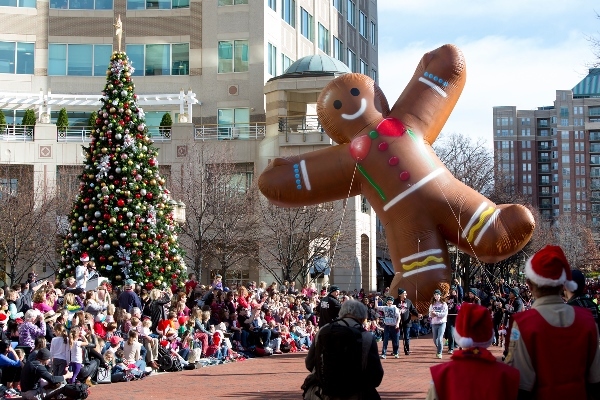 8 a.m.: Gingerbread Man Mile – A one-mile race aimed at kids 14 and under. Registration is only $10. First age group races at 8 a.m.
8 a.m. – 11 p.m.: Ice Skating – The skating pavilion will be open all day with extended hours. 11 a.m.: Annual Hometown Holidays Parade Kick-Off – The one-hour event features “Macy’s-style balloons, marching bands, dancers, antique cars, characters, community groups, dignitaries, Washington Nationals Racing Presidents and much more,” all building to an appearance from Mr. and Mrs. Claus themselves in a horse-drawn carriage. The parade will go on, rain or shine. 12:30-4:30 p.m.: Photos With Santa and Mrs. Claus – Attendees who donate any amount can get a photo with Mr. and Mrs. Claus. All proceeds will benefit the South Lakes High School Chorus. 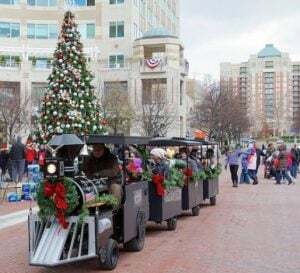 12:30-4:30 p.m.: Mini-Train Rides – The train rides depart next to Talbot’s (11900 Market St.) All proceeds benefit local organization Cornerstones. 5 p.m.: Conservatory Ballet Performance – A free holiday-themed dance performance in Fountain Square, with the large holiday tree serving as backdrop. 6 p.m.: Holiday Tree Lighting and Sing-Along – Santa and Mrs. Claus are slated to ride up to the tree in their carriage and help light the festive display. The event will be followed by a holiday-themed sing-along led by the Reston Chorale and accompanied by a brass quintet. 6:30-10 p.m.: Horse-Drawn Carriage Rides – Rides, which depart next to Talbot’s (11900 Market St.), are $5 per person, or free for children 5 and under when accompanied by a paying adult. All proceeds will benefit the local charitable organization Volunteer Fairfax.